Khaya anthotheca is a large deciduous tree capable of growing up to 50m in height often with buttress roots. On older trees the bark is fairly smooth, grey to brown and flakes off in round scales. The leaves are compound and reddish when young, turning green with age. Flowers appear as branched clusters, white and sweetly scented, the fruit is a spherical woody capsule revealing winged seeds. This tree is native to tropical Africa from Sierra Leone eastwards to Uganda and Tanzania and southwards to Angola, Zambia, Malawi, Mozambique and Zimbabwe. Within its native range it occurs in riverine, groundwater, lowland and lower montane forests from 0 to 1500m. This species provides one of the most important timber woods in Africa. The timber is moderately strong and quite light; it is easily worked and polishes well to give attractively coloured finished products. It is an excellent wood for decorative furniture, veneers, panels and plywood. As a result, the species is heavily exploited in East and West Africa for its valuable wood. The bark and roots of K. anthoteca are also used medicinally to treat colds and coughs. Regeneration is poor in places where parent trees are scarce and serious genetic erosion is thought to have occurred. Some sub-populations of this species have been protected and log export bans and felling limits have been put in place in various countries. This species is involved in the BGCI project Enhancing tree conservation and forest restoration in Africa. 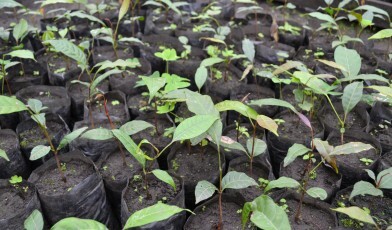 This project aims to promote the use of indigenous and endangered tree species in forest restoration projects across Africa. The project is undertaking restoration trials involving this species. Further information and results from trials will be communicated in future on the GTC website. Read more about this project on the BGCI website.